TORONTO, Dec. 11, 2017 – Chief financial officers must embrace technology if they are to remain relevant in this fast-changing world, says Gary Kent, ACCA, commissioner of corporate services and chief financial officer, City of Mississauga, Canada. 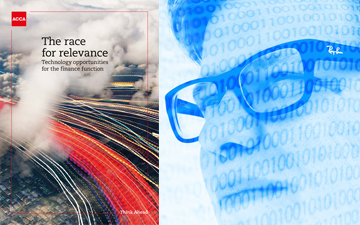 Kent is a contributor to a new ACCA global report, The Race for Relevance, which asserts that CFOs develop a roadmap to adopt new technologies in order to remain competitive and relevant amid a fast-moving digital landscape. Canadian accountants in technology decision-making positions may find the report’s coherent and logical program for technology adoption — which the ACCA calls six imperatives for success — to be helpful in creating roadmaps. Kent’s team at the City of Mississauga was recently recognized by the Public Sector Digest with a “Most Improved” Award for the 2016 Open Cities Index, which acts as a benchmark of Open Data initiatives for municipalities across Canada. “The core elements of people, processes, technology and data thread through any activity,” says Kent. “Addressing each of these within an organizational culture that supports innovation and creativity is important for harnessing emerging technologies. Today’s business environment is as much about using data to create and provide complementary services that the existing customer needs as it is about growth from extending the customer base." Colin Ellis is the editor of Canadian Accountant. With files from the ACCA.